VibSpec is gladly available to advise on subjects in the field of near-, mid- or far-infrared and Raman spectroscopy. We offer our expertise on the use of accessories, software, multivariate data analysis and the interpretation of spectra. The on hand equipment at Utrecht University covers the complete vibrational spectrum from 10,000 -100 cm-1. 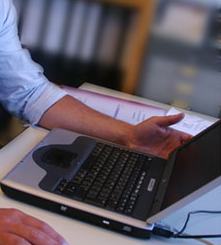 Gases, liquids as well as solids can be analysed in infrared and Raman by a variety of techniques such as ATR, DRIFT, specular reflection and emission. An infrared imaging microscope allows the analysis of samples down to 5-10 µm2. For Raman spectroscopy a dispersive instrument with a probe head and a 532 nm laser and a microscope equipped with a 785 nm laser form part of the standard equipment.